What is Not Having a Smart Safe Costing You? Retailers who deal with cash deal with costs. By leveraging antiquated, manual methods of cash management, costs associated with cash handling can add up quickly. In a store environment, the primary responsibility of managing the store’s cash usually falls on the store manager. Store managers are primarily responsible for scheduling and directing day-to-day operations, managing employees, fostering a welcoming and positive shopping experience, and ensuring the store is adequately merchandised, all while creating strategies to propel sales, boost profitability, and expand the store’s clientele. If store managers are busy in the back office reconciling sales, counting money, and preparing deposits, they’re not on the floor making contact with customers, giving them that distinctive personal touch. If store managers are making daily bank runs, employees are without guidance and supervision for up 3-5 hours per week, not to mention the personal risk and liability associated with transporting money to the bank each day. A Tidel smart safe automates and streamlines the cash operations of a busy retail environment, all while deterring theft, reducing bank fees, and providing unparalleled transparency to all cash transactions. A smart safe frees up a store manager’s time to be more productive in tasks better suited to the position: managing the store successfully and providing outstanding customer service. 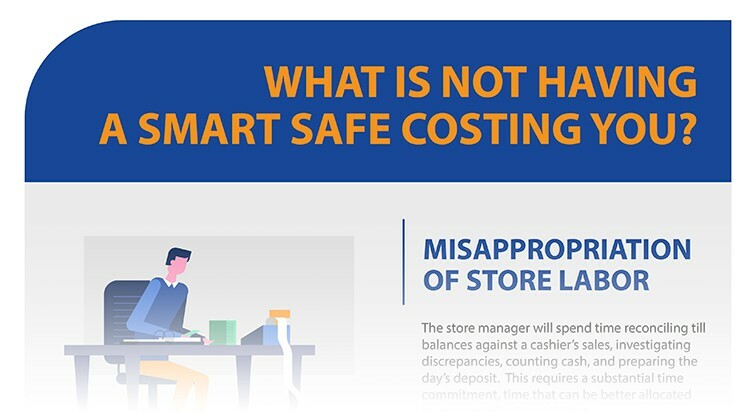 The following infographic provides a summary of a few challenges a retail establishment will face by not adopting a smart safe. Are you dealing with one or more of these issues? Please contact us at sales@tidel.com and let us help recommend the right solution for you to achieve better efficiencies in your daily cash operations.